For a spray tan that looks completely natural, L'Oreal Sublime Bronze Pro Perfect earns props from both experts and users. It's suitable for all skin types except sensitive skin. For those who don't want to deal with the learning curve associated with spray tanners, L'Oreal Dermo-Expertise Sublime Bronze Self-Tanning Gelee is a fast-drying gel that spreads evenly for a long-lasting, streak-free tan. 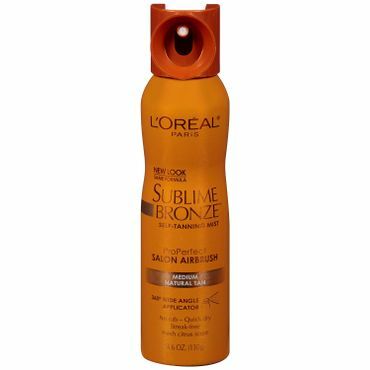 L'Oreal Sublime Bronze Pro Perfect is the top choice of several experts as a great home spray tanner. In professional tests it produces a quick, natural-looking color and goes on smoothly and easily. It does require some practice -- and most experts say having another person to help apply it is even better. The wide, 360-degree applicator earns particular raves and speeds up the tanning process, users say. It also dries quickly. L'Oreal Sublime Bronze comes in two shades, medium natural and deep natural. If you don't want the hassle of learning to use a spray tanner (or the mess), L'Oreal Dermo-Expertise Sublime Bronze Self-Tanning Gelee is an easy-to-apply gel formulation that dries fast, leaving a streak-free tan that lasts for several days to a full week. It's enhanced with vitamin E and AHA, leaving skin feeling soft and smooth. It can be applied daily until you've achieved your desired look, and then reapplied once or twice weekly for maintenance. It comes in two shades, medium natural and deep. Spray tanning products can be self-applied or done professionally in a tanning salon. They take a bit longer to dry than a mousse, but promise full-body, even color with a quick application. Many experts say this type of application has the steepest learning curve and recommend having a friend spray it on for the best results. When done right, spray tans look the most natural and smooth. Lotions, gels and oils are considered the easiest to apply, making them a particularly good option for first timers. Because they dry slowly, you have a little extra leeway in wiping or washing off any misplaced product. The downside of that slow drying time is that you can't put clothing on for 10 to 30 minutes while the product soaks in. Lotions and gels are usually best for normal to dry skin, but that will depend on the specific formula. Whichever type of sunless tanner you choose, it's important to remember that your bronzed skin won't offer you any protection from harmful UV rays. Check out our report on sunscreens to prevent sunburn and sun damage. And it's also important to take care of your delicate skin in other ways. To help with that we also have separate reports where we recommend the best facial cleansers, facial moisturizers, wrinkle creams and body lotions. There's no doubt about it: A professional spray tan is the ultimate in fake tans. Self-tanners in spray formula can give you the look of a professional tan in the privacy of your home, saving you money in the long run. Experts say spray formulas take longer to dry and have a greater learning curve when it comes to applying them properly, but once you get the hang of it, spray self-tanners offer a smooth, even color appearance. Professional testers say L'Oreal Sublime Bronze Pro Perfect (Est. $11 for 4.6 oz.) results in a natural-looking tan with very few reports of any odd, orange or green undertones. Most users agree, saying they love the professional spray tan vibe it gives them. Skincare experts at Beautypedia give it four stars, noting that it's an alcohol-free formula that's suitable for all skin types except sensitive. It contains the same skin-darkening ingredient found in most tanning lotions: dihydroxyacetone (DHA), although it does contain fragrance chemicals that may cause irritation in some users. There's a learning curve to getting perfect results -- it's important to spray evenly and avoid spraying the same area twice to avoid streaks and uneven color, for instance -- but most reviewers say that once you've mastered the technique, using L'Oreal Sublime Bronze is quick and easy. It also dries more quickly than most spray tanners, users add. That said, to get best results, at least initially, you may want to involve a friend. Those who use the buddy system report more satisfaction with this spray tanner than those who try to go it alone. The Pro Perfect's wide, 360-degree spray nozzle earns kudos from users and professionals alike for producing a fine, targeted mist without a lot of overspray. L'Oreal Sublime Bronze supplies an instant tan, but it also darkens in a few hours. You can reapply multiple coats for even more color, but most users caution against more than two coats, saying it can cake or flake if you lay it on too thick. The color lasts a good amount of time -- several days at least - although it may lighten after a shower or two. As with all self-tanners, reviews on the perceived pleasant -- or not so pleasant -- scent are mixed. If you're looking for tanner legs, Beautypedia's experts rave about Sally Hansen Airbrush Legs Spray-On (Est. $13 for 4.4 oz. ), giving it a perfect 5-star rating. It's marketed as "leg makeup," and for good reason -- it works much like airbrush makeup, instantly leaving your legs with a tanned glow. It's also useful for covering up imperfections, such as skin discolorations or varicose veins. Editors say it dries quickly, so you need to apply it quickly to avoid streaks, but once dry, it won't rub off on your clothing or fade or smear when walking, crossing your legs or even taking a dip in the pool. Like most spray tans, Sally Hansen Airbrush Legs can be tricky to apply at first, but users say you don't need to worry about sporting streaky legs for days -- it washes off easily with soap and water or body wash. Users say it looks natural and, while it's intended for use on the legs, several say they've used it on their chest, shoulders, back and other areas of the body as well. Some even report using it on their neck and face, noting that it doesn't clog pores or irritate sensitive skin. That said, we read a few complaints from users who say -- contrary to the experience of Beautypedia's editors -- that it can rub off on clothing and upholstery. This spray tan creates a bit of a shimmery look -- some reviewers describe it as sparkly or glittery -- that some users love and others hate. If you can't stand the scent of other self-tanners, the perfume-free Coola Sunless Tan Dry Oil Mist (Est. $45 for 3.4 oz.) is mostly well-received by Good Housekeeping's testers, who say it absorbs quickly and leaves their skin feeling great. Some testers, though, say the mist is more difficult to control compared to tanning lotion -- it's a pump spray rather than continuous aerosol and goes on nearly clear -- and left some streaking, an opinion echoed by some users. Most reviewers, however, say it's easy to apply, isn't sticky and never streaks, creating a naturally tanned look without a hint of orange. As with most spray tans, there's a learning curve to getting the application technique just right. Coola Sunless Tan Oil Dry Mist is smudge-proof, meaning it won't transfer to your clothes or sheets, and it's 70 percent organic, containing a vegan-friendly blend of argan oil, vitamin C, hibiscus and chamomile extract. It's also free of parabens, pthalates and synthetic colorants. While it is perfume-free, it does contain natural pineapple and coconut fragrance, giving it a light tropical scent that users say is subtle. Some say that it does develop the telltale self-tanner scent after application, but it's much less noticeable compared to other tanning lotions. It's a build-able self-tanner, meaning you can layer applications until you've achieved your desired tan. The color takes two to four hours to develop and lasts for about three days. Experts say that if you've never tried a self-tanning product before, tanning lotions are a good place to start. They tend to be very easy to apply, most have moisturizing properties, and they're more affordable than some other types of self-tanners. In addition, experts say that lotions offer a longer-lasting tan than sprays do. Some people prefer gel or mousse formulations, which often dry faster, and some are easier to apply evenly compared to tanning lotion. One gel formulation, L'Oreal Dermo-Expertise Sublime Bronze Self-Tanning Gelee (Est. $12 for 5.0 oz. ), earns praise from hundreds of reviewers. Users say it applies like a sun tanning oil, but it doesn't stay greasy, drying quickly without leaving an orange hue. It's colorless when applied and won't rub off on clothing or bed sheets, users say, but the natural-looking tan lasts for a few days to a week on the skin. It's meant to be applied daily until you've achieved your desired color, then reapplied once or twice per week to maintain your ideal tan. Enhanced with vitamin E and AHA, L'Oreal Dermo-Expertise Sublime Bronze leaves skin feeling soft and smooth. Skincare experts at Beautypedia say its "nearly weightless texture" makes it ideal for normal to oily, blemish-prone skin. Like most self-tanners, the active tanning ingredient in this self-tanning gel is dihydroxyacetone, but it also contains caramel coloring that leaves a sheer tint. Reviewers say it spreads smoothly and evenly on the skin, making it easier to use compared to many tanning lotions and resulting in more even, natural-looking color that develops in a few hours after application. On the downside, a few users complain about its strong, perfume-like scent, but most users say it doesn't linger long after application, and some don't mind the smell at all. If you want your tan and you want it now, and you're willing to pay a bit more to get it, Clarins Self Tanning Instant Gel (Est. $30 for 4.5 oz.) gets raves for its performance, providing a quick, dark tan that users say goes on smoothly and evenly. Gels take longer to dry than lotions, but you can still expect to be able to dress in about 30 minutes or so without getting color on your clothes. Users say that it goes on colorless and feels like lotion, earning praise from light-skinned users who say it doesn't leave them with an orange tint like many self-tanners. A few of Good Housekeeping's testers say it creates a natural-looking, streak-free color, but with a couple of tradeoffs: some say it leaves a tacky, sticky feeling on the skin and has an unpleasant smell during application. Other reviews, however, say the scent is pleasant or unnoticeable. If you prefer a tanning lotion over a gel formulation, Clinique Self Sun Body Tinted Lotion (Est. $30 for 4.2 oz.) is a lightweight lotion that's suitable for all skin types, Beautypedia's experts say. 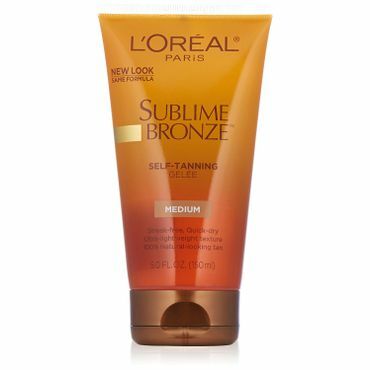 Like L'Oreal Dermo-Expertise Sublime Bronze, Clinique Self Sun Body Tinted Lotion contains caramel tint that provides instant color, while the lasting color (from the common self-tanning ingredient DHA) develops over a few hours. It's fragrance-free, and its texture makes it a "safer bet for those prone to blemishes," editors say. It also contains mica, which gives the skin a slight shimmer. Users say it's easy to apply and creates an even tan, but many reviewers say it has an overpowering, unpleasant scent. We also read a few complaints from users who say the color fades quickly and rubs off on towels, clothing and bedding. Among mousse formulations, St. Tropez Self Tan Express Advanced Bronzing Mousse (Est. $45 for 6.7 oz.) earns the most positive feedback. It's an advanced formula that can be left on for an hour for a light, sun-kissed glow, for two hours for a medium, golden tan, or up to four hours for a deep, dark bronze, depending on your natural skin tone and desired result. It has a light scent and, when applied evenly with the mitt, it creates a natural, streak-free tan with no orange undertones. We didn't see any expert reviews for Fake Bake Flawless Self-Tan Liquid (Est. $20 for 6.0 oz. ), but it gets a lot of love from thousands of user reviewers who say it creates a true, natural color that never strikes a sour note. They also say that, compared to other self-tanners, it's a great value for the price. Though it comes in a spray bottle, you spray it onto an included mitten and apply it like a lotion. It gives you immediate color and most say it lasts for several days, although others say it wears off quickly and you have to reapply it frequently. Its fast-drying formulation is fast-absorbing and also transfer-resistant, meaning it won't discolor your sheets or clothing. As is the case with nearly all self-tanners, users' opinions are mixed on the scent of Fake Bake Flawless. Most reviewers say it doesn't have a harsh or unpleasant smell, but some do say it acquires the typical self-tanner scent after several hours, and a few note that its tropical scent is "heavy." We found the most comprehensive professional reviews of self-tanners at Beautypedia, and Consumer Reports compares several tanning lotions in an older review. Good Housekeeping identifies the best self-tanners based on testing conducted by the Good Housekeeping Institute Beauty Lab, although this roundup also includes "other online bestsellers." Glamour and TotalBeauty also recommend the best self-tanners based on reader or editor opinion, rather than hands-on testing. For user opinions based on real-world use, we turned to Amazon, Sephora and Ulta, where some tanning lotions have earned thousands of reviews.